These are your awards, too! Most people shopping on the internet never see who they're buying from. Not so with The Orange Shop. Many of our fruit shipping customers also stop at our store in Citra, where they can taste the fruit and meet the team members who pick, pack and ship your fruit. Our doors are always open, and we are never too busy for a good visit with folks who are traveling through. If you won't have that opportunity because you're stuck somewhere else, here's a little bit of information about who we are. As you'll see, we are totally real, and believe in being completely open and transparent because we try to do things right in all ways. The awards and recognition we receive only serve to reinforce our commitment. Of course, the greatest obligation we have is to you, our customers. By doing business with us, you support our efforts to preserve the environment and make the world a better place. So, you're the recipient of these awards, too! We're not just a story -- we're a lifestyle, and you're part of it. Thank you for your business that makes it all possible. 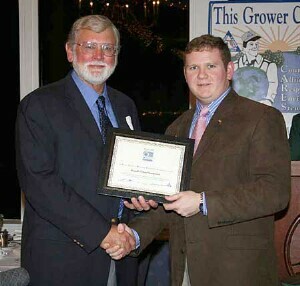 Our leadership in environmentally responsible growing practices over the years was recognized by Charles Bronson, the Florida Commissioner of Agriculture in 2010. Recipients of this award are nominated by their peers in the industry. We feel very honored, and grateful to those who regarded us worthy of this outstanding recognition. The video you'll see if you click here, or on the image on the left, tells the whole story. The CARES program was implemented in 2001 to promote environmentally sound and economically viable farming. 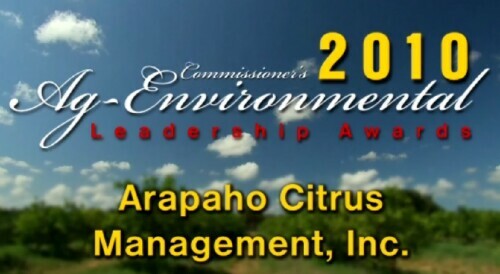 It focuses on recognizing producers who have voluntarily implemented BMPs in their operations. CARES brings agricultural associations, public agencies, institutions and farmers together to increase environmental awareness. CARES is a county-based program open to all farmers. 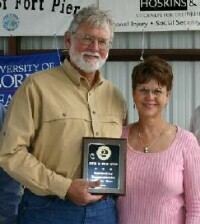 Pete and Cindy received the Award in 2008 along with their partners Lane Brown and Buddy Johnson. The Conservationist of the Year is presented by the Treasure Coast Resources Development Council to farmers and ranchers who have shown leadership in conserving the environment and natural resources in St. Lucie County, Florida. Pete and Cindy live in the city of Ft. Pierce, in St. Lucie County, which is the Heart of the Indian River Citrus Growing Area. They are the third generation to farm some of the original Indian River citrus groves, producing fruit for customers of The Orange Shop. They have been proponents and innovators of sustainable farming practices, including the use of Best Management Practices. 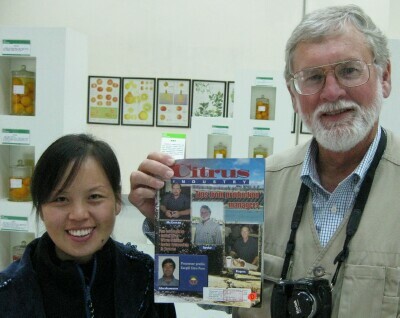 By "recognized", we mean that when we were touring an agricultural laboratory in Wuhan during the 2008 International Citrus Congress in China, one of the students came running up saying "I know you!". 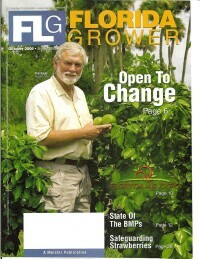 Then she showed us an issue of The Citrus Industry Magazine from Florida that had a picture of Pete on the cover. There was an article in that issue with an in-depth review of our work in introducing new citrus growing practices, and her class had studied it as part of their course work. Is that cool or what! Pete and Cindy were the only citrus growers from Florida in attendance. We had a chance to see old friends in the citrus business from around the world, and make new acquaintances we hope to see again. We don't just keep up with what's going on in the citrus industry in Florida -- we have lots of friends and contacts from other countries who we keep up with, too. We're very blessed to have such wonderful recognition of our work. We do what we do because we think it's just the right thing, but a pat on the back is always rewarding.